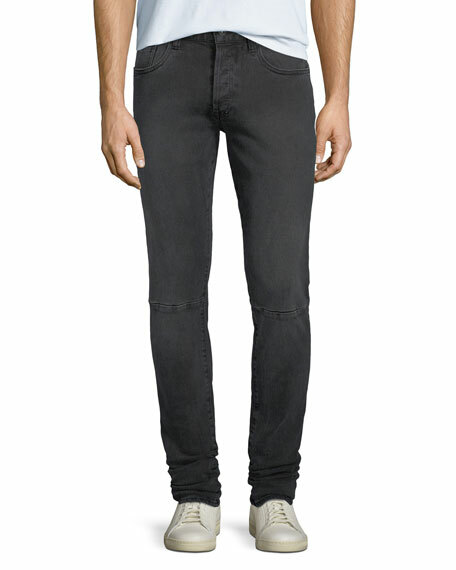 Prps "Windsor" fit jeans in black denim with light whiskering and fading. Skinny fit through tapered leg. Balmain jeans in distressed stretch-denim. Leg opening, approx. 13". Moto-style details, including ribbing and seam detailing. Five-pocket style. Logo patch at back waist. Slim fit through skinny leg. Hook and eye/zip fly; belt loops. Cotton/polyurethane. Made in Japan. Diesel Krooley Jogg Jeans in sweatpant denim. Approx. measurements: 12" rise; 32" inseam; 41" outseam; 14" leg opening. Five pocket style with signature stitching on back pockets. 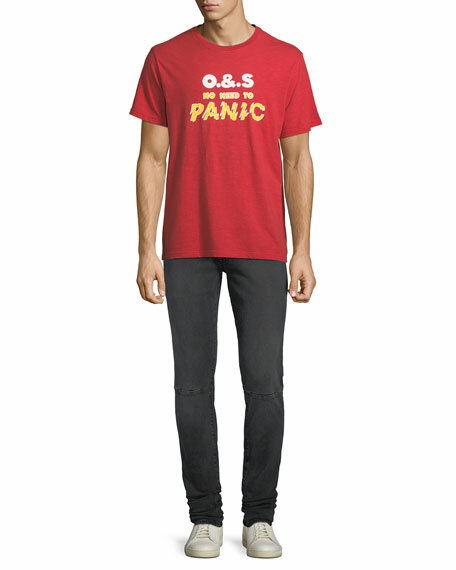 Slim-fit, slightly tapered legs. Cotton/polyester/spandex. Machine wash. Imported. 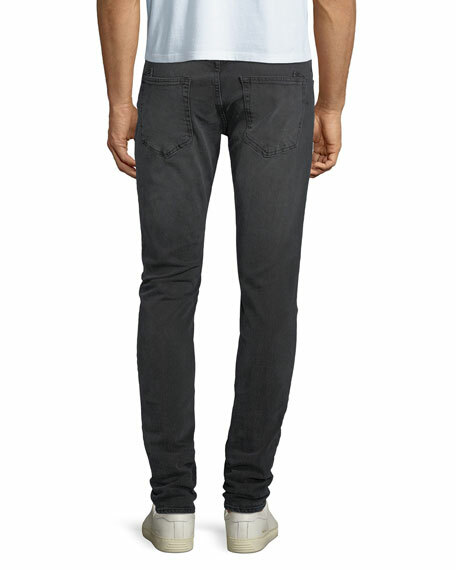 Diesel "Sleenker" fit denim jeans with heavy fading, rips, and distressed detail. Approx. measurements: 10.5" rise; 32" inseam; 42" outseam; 13.5" leg opening. Five-pocket style; V stitching on back pockets. Skinny, narrow fit from knee to ankle. Button/zip fly; belt loops. Cotton/spandex. Machine wash. Imported. FRAME jeans in subtle-stretch denim. Approx. 10" rise; 32.5" inseam; 13" leg opening. Natural rise; belt loops. Button/zip fly. Five-pocket style. Slim fit; skinny legs. Cotton/modal/polyester/spandex. Machine wash. Made in USA. Model's measurements: Height, 6'1"/185cm, waist 31"/79cm, suit 40, shirt 15.5x35, inseam 32"/81cm.